Paramount Picture’s “TRANSFORMERS: AGE OF EXTINCTION,” the fourth film in director Michael Bay’s global blockbuster franchise is now the highest grossing film in China, earning US$225.1M (1,396M RMB) in just 12 days of release, surpassing the prior record holder “AVATAR”. In China, where “TRANSFORMERS: AGE OF EXTINCTION” was partially shot, the film earned $92M in its opening weekend, more than doubling the TRANSFORMERS: DARK OF THE MOON result and representing a record for the largest opening weekend for a film. On its opening day Friday, June 27, the film earned $30M, a record for the largest opening day for a film in China. The fan favorite movie continued the series’ tradition of box office reign with over $600M earned worldwide since its opening on June 27th. Opening in 37 international territories and North America, and introducing a new chapter in the TRANSFORMERS universe, the film earned $185,397M domestically and $421.2M internationally thru Tuesday, July 8th. Bay’s “TRANSFORMERS: REVENGE OF THE FALLEN” in 2009 grossed more than $830 million worldwide. In 2011, “TRANSFORMERS: DARK OF THE MOON” was an even bigger hit worldwide, grossing more than a billion dollars to become the 7th highest grossing film of all time and earning $165M in China. TRANSFORMERS: AGE OF EXTINCTION dethrones IRON MAN 3 to become the no. 1 movie with the biggest 4-day opening weekend box office of all time in Singapore. With a 4-day opening weekend box office of 5.2 million, it was a phenomenal success for TRANSFORMERS: AGE OF EXTINCTION, beating not only the top blockbusters so far this year such as THE AMAZING SPIDERMAN 2 and X-MEN: DAYS OF FUTURE PAST, but also every other movie title ever released in Singapore, including Marvel’s THE AVENGERS and all three previous Transformers movies. TRANSFORMERS: AGE OF EXTINCTION was also the only movie being released in Singapore on its opening day of June 26. The 4th installment of the immensely successful Transformers franchise, TRANSFORMERS: AGE OF EXTINCTION picks up after events of TRANSFORMERS: DARK OF THE MOON, in which an epic battle left a great city torn, but the world saved. Besides the return of fan favorites Optimus Prime and Bumblebee, the larger than life Dinobots will be making their debut in this movie. TRANSFORMERS: AGE OF EXTINCTION also stars an all new live action cast lead by Mark Wahlberg, Stanley Tucci, Li Bingbing , Kelsey Grammer, Sophia Myles, T. J. Miller, Nicola Peltz, Jack Reynor and Titus Welliver. The film is produced By Don Murphy & Tom DeSanto, Lorenzo Di Bonaventura and Ian Bryce. Based on Hasbro’s Transformers™ Action Figures. Written By Ehren Kruger. Directed By Michael Bay. TRANSFORMERS AGE OF EXTINCTION is now showing in Singapore at all 3D & IMAX 3D cinemas. The movie is also available in Dolby Atmos and D-Box cinemas. To bridge the gap between the end of the third film, and the beginning of AGE OF EXTINCTION - in the world post–Chicago, the existence of Transformers is no longer a secret and they are being hunted down because of the threat they pose to humans. The site will function as a propaganda site within the world of this fiction and will feature videos and articles pertaining to the threat the Transformers pose to our world. 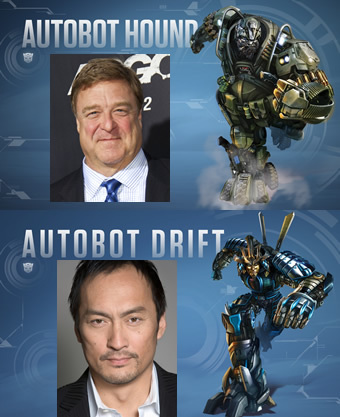 JOHN GOODMAN AND KEN WATANABE JOIN THE AUTOBOT VOICE CAST IN MICHAEL BAY'S "TRANSFORMERS: AGE OF EXTINCTION"
Director Michael Bay has tapped John Goodman and Ken Watanabe to voice two all new Autobots in his highly anticipated film TRANSFORMERS: AGE OF EXTINCTION, the fourth film in the global blockbuster franchise from Paramount Pictures. A new chapter in the Transformers universe, “TRANSFORMERS: AGE OF EXTINCTION” stars an all new live action cast lead by Mark Wahlberg, Stanley Tucci, Li Bingbing , Kelsey Grammer, Sophia Myles, T. J. Miller, Nicola Peltz, Jack Reynor and Titus Welliver. “TRANSFORMERS: AGE OF EXTINCTION” begins after an epic battle that left a great city torn, but with the world saved. As humanity picks up the pieces, a shadowy group reveals itself in an attempt to control the direction of history… while an ancient, powerful new menace sets Earth in its crosshairs. With help from a new cast of humans, Optimus Prime and the Autobots rise to meet their most fearsome challenge yet. In an incredible adventure, they are swept up in a war of good and evil, ultimately leading to a climactic battle across the world. The film is produced By Don Murphy & Tom DeSanto, Lorenzo Di Bonaventura and Ian Bryce. Based on Hasbro’s Transformers™ Action Figures. Written By Ehren Kruger. Directed By Michael Bay.